19949Z-SSSD-DST is rated 4.9 out of 5 by 46. 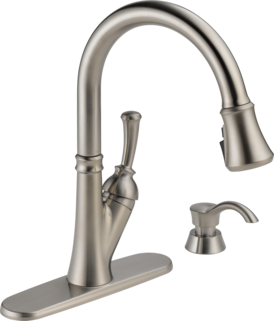 Rated 5 out of 5 by Teddy19 from Love the pull down with 3 differenet sprays This is the second Delta Faucet as I purchased one for my other home before I sold it and loved it. 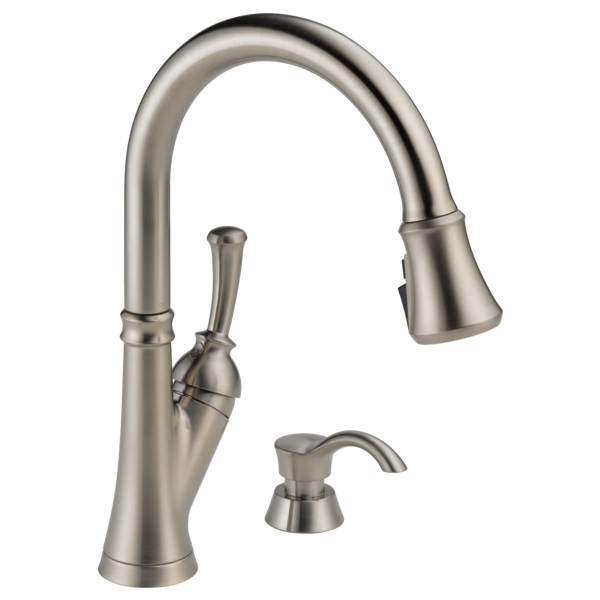 Makes wife happy and you know the saying;"Happy Wife, Happy Life"
Rated 5 out of 5 by homeowner from Bronze kitchen faucet We had this installed 3 weeks ago and I love it. Our plumber said that Delta was an excellent choice since there is a lifetime warranty. I love the 3 spray features, especially the one that keeps the water from splashing all over me when I need a strong stream of water. Rated 5 out of 5 by Alan from Nice quality faucet at a reasonable price. Fits in with the kitchen decor and swivels very easily. Great warranty. Rated 5 out of 5 by Bobby from Easy install and great features. I purchased this faucet to replace my 5 year old Pfister that failed in several areas. The install was simple and straight forward but required two people simply because you need someone to hold the faucet while you tighten it down. I installed it on my four hole granite countertop. The faucet works well and the pull down feature is a plus. Getting used to the single handle faucet is a bit of a challenge if you switch from a double handle type. Not a big deal though. The soap dispenser is an added plus. I was a bit concerned about water leaking around the base of the faucet from dripping wet hands but it comes with a seal to install under it. No leaks at all. I did not need any type of sealant or silicon for the install. Great faucet, great features, and great design. Rated 3 out of 5 by Bill1 from Kitchen Faucet Had this faucet installed and its operation is totally opposite of the Moen unit we've had for over ten years. Rated 5 out of 5 by Laura from Love Love Love I saw it on-line, then loved it even more when I saw it at Lowe’s. It works very well, love the look & different spray options! Awesome! Love washing my dishes now! How high does this stand? Guess there is 50% chance of getting it right. There were no red or blue markings, just grey tubes, even looked inside the threaded ends but again no difference in color. Most likely the factory just uses one color because the instructions do not list which tube is hot or cold. Hot is always on the left in plumbing. But since Delta designed the handle to be where it is, it is just a guess. After all its just too easy to label or color code anything.